Specialized coverage for your appliances, starting at $50/year. We are the only broker in BC to offer this unique insurance coverage. Protect your household appliances and home systems for a few dollars a month. Regardless of their age, each of your appliances can be insured including your refrigerator, gas or electric stove, dishwasher, washing machine, dryer and all major home systems. While repairing your item is the first priority, if it can’t be repaired, your item will be replaced with a similar one (if available), or you will receive a cash settlement. Interior Home Breakdown Protection is an affordable solution to cover the repair or replacement of your home’s systems or major appliances when they break down. 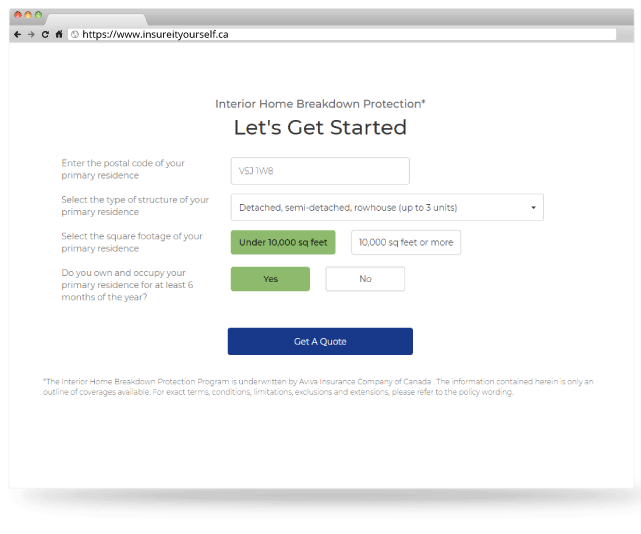 Simply enter some details about your primary residence to start the process. Your home has a number of appliances and systems to keep it running smoothly. Choose at least four items you wish to include in your coverage. There is no maximum number of appliances or systems you can insure. 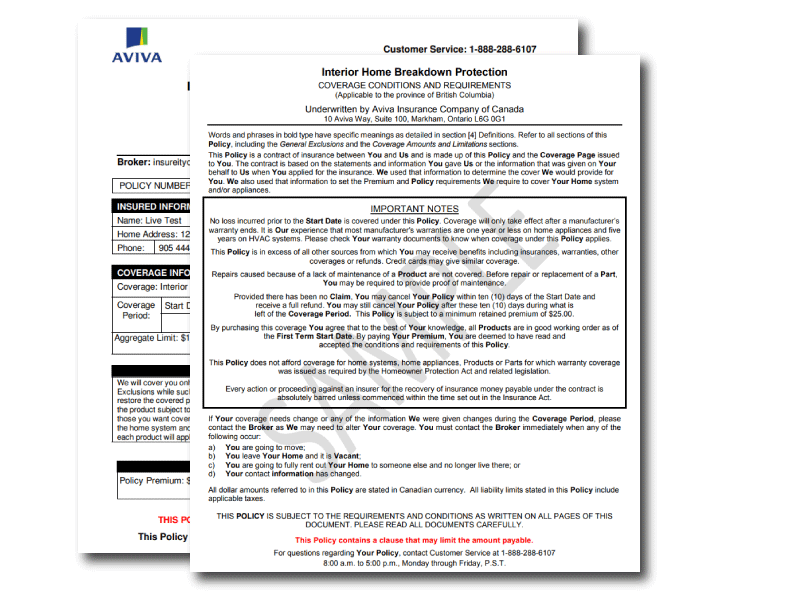 Once you have completed the process, we will email you a copy of your policy in real-time. That means the moment you click ‘Submit’, you will find your policy along with your receipt in your inbox. It really is that simple. 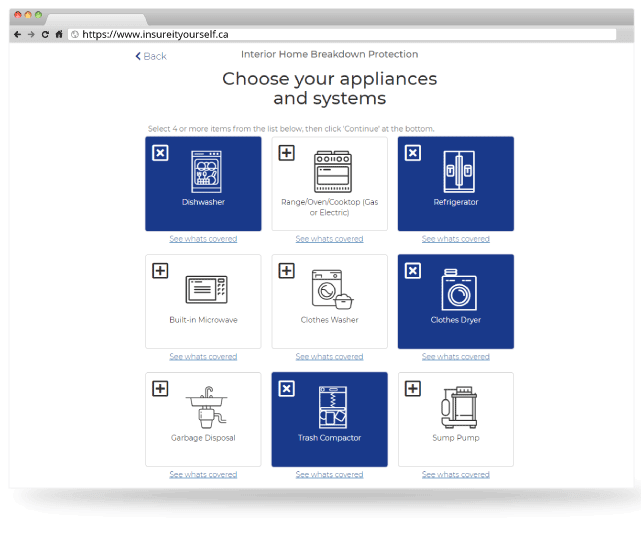 Choose at least 4 items to insure from your appliances and home systems. Coverage is provided up to $10,000 per item. Select a minimum of 4 items to cover. These items can be just appliances, just home systems or a mix of both of them. You can also select your deductible as well as the number of items you want coverage for to control the amount you wish to spend on this insurance package. Coverage is provided up to $10,000 for the repair or replacement of your appliances or home systems after the manufacturer’s warranty has expired. Your items do not require a pre-inspection and coverage is offered regardless of the age of the appliances or home systems. Two repairs per item within a 12-month period with all repairs are done by qualified technician. Getting your household appliance or home system repaired is just a phone call away with all repairs being done by a qualified technician who carries liability insurance. Emergency repairs are also available, if needed. Best of all, any claim you make won’t affect your home or condo insurance policy. As this is a stand-alone product, any claim you make against your household appliance or home system will not affect your standard home or condo insurance policy. That means you won’t see an increase in premium for your home or condo policy the following year, as a result of a claim that you make using our appliance breakdown insurance policy. That’s a win-win.